This is quite an amazing story !…… First we will rewind back in time to Johns final months of active duty in WWII, the date is June of 1945 and the place is Victorville Army Airfield in the Mojave Desert, California. John had just returned from his tour overseas of 14 Bombing Mission’s and 39 OSS Mission’s (All in B24’s) for which he received the Distinguished Flying Cross. Now his post combat assignment back here in the States was B24 Engineering Test at Victorville. He served his remaining time in WWII here from June of 1945 until February of 1946. It was here, in Victorville, that John flew his very last flight in a B24. The exact date of that flight was November 15th 1945!……. John still has the logbook that he recorded that flight in ! 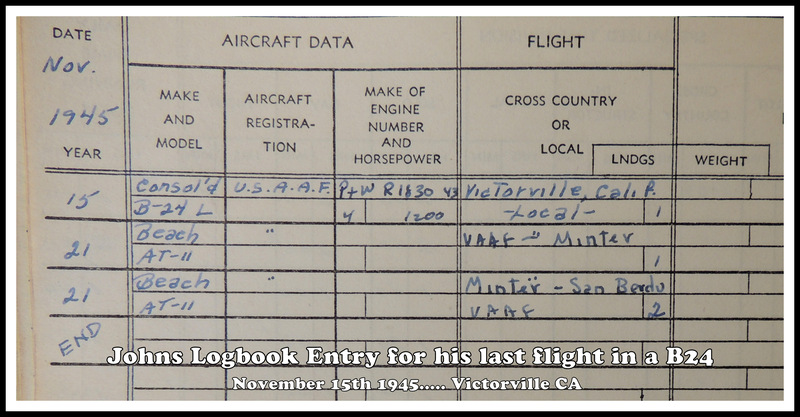 Here is a picture of Captain John holding his log book showing his last flight in a B24 at Victorville CA, November 15th 1945 ! Now, lets fast forward back to the present and the time is July 2015. John and I are soon to depart on our Epic Flight Around the Country in Johns Cessna Cutlass 172RG. The purpose and goal of this flight is to bring as much support and attention to Charitable Flying as we can. We have many stops planned around the Country, but one that stands out more than any other is Victorville California! When we stop at Victorville it will be the first time John has landed back there since WWII 70 years ago this year (Yes, you read right, 70 years ago!) At the exact location where he flew his last flight in a B24 ! This is so Amazing …… and you might ask…. what has John been up too during these past 70 years ?……. and the answer would be Flying ! John has never stopped flying during this time and he has accumulated well over 28,000 flight hours of which 35 years was with Eastern Airlines and the past 10 years flying Angel Flights for Angel Flight Mid-Atlantic. John is one of the most active general aviation Pilots you will find and he has no plans of slowing down. And I might add that during our flight around the Country John will celebrate his 92nd Birthday ! John is truly an Aviation Legend and an American Hero …… A Man that has Flown in War and in Peace, with an original Mission to help keep our Great Country Free and now to lend a hand to Those in need. What an Honor it is for me to Share in this Mission around Our Great Country with him ! Thank You So Much Captain Billings ! This is so Worthy of National News Coverage, and I can see the Headlines now…….. WWII Decorated B24 Bomber Pilot, landing back at Victorville 70 years after his last flight in a B24…… Still Active, Still Flying and Still a True American Hero ! Roy Nilsen: Only superlatives are appropriate to such a story, Nevin!! God bless you both!! Thank You Both ! ….. It is truly an Honor ! Wonderful. It’s so nice when special people get recognition they deserve. Plus it shows the world there ARE good people out there. Great job Nevin I love reading your writings!! So glad I met you and I am so excited about the trip! I agree with you totally Tracy.Mr.John is a Amazing Man and very young man for his age.My brother Nevin is a humble man for sure and works hard for something he truly loves to do.he always says its not work it’s something i love to do.He is a caring man just as Mr. John so yes they make a perfect Team.He has worked day and night to make this Amazing Jouney happen.my brother always says its not work if its something I love to do.God Bless them both..Their meeting each other years ago was meant to be..Two Angels living among us all.I love them both so much. Thanks, for the info on John. I am really enjoying your flight. Have a safe flying day! John and Nevin, it was not only a pleasure to meet you, but also an honor. You two are a great team and bring honor, respect and love to the flying community. I am proud to have met you here at Million Air Victorville. As a line service professional, we tend to meet and greet many. This day will stand out in my career. Thank you for visiting us, continue the great work you do and keep flying! May God bless you and keep you safe. So many comments and Tracy Jenkins says so much about Dad and his generation Thanks Nevin for the updates! Decorated WWII pilot lands in Victorville Ca after 70-year absence http://www.vvdailypress.com/article/20150730/NEWS/st_refDomain=www.facebook.com&st_refQuery=/ Consistent clear skies, wonderful tailwinds and abundant Blessings for Dad and Nevin on this and every flight!